The Consciousness that is to be considered in the word and Medicine of Actualization is that of Facilitation and Support to the Flow of the Light Love and Benefaction of Great Pop. The Consciousness that is to be associated to the word of Actualization in the Medicine and Proper Way can also be considered in the simplest terms as being the reality that All Prayers are answered by Great Pop and the All in some manner or form. The Consciousness that is to be considered with Actualization Proper has no condition to judgment or measurement of any kind. This condition and consideration also naturally precludes any influences from one’s Bark on tree as well. As with the others, the Consciousness of Actualization Proper is another expression that is both inward and outward, and thereby is of that influence and nature. While Actualization Proper is most often considered as being participant in an expression or experience in some manner, it also is a State and Reality as well. The Medicine of the number of sixteen and Actualization Proper is not so much about the accomplishment of anything except that of the expansion of one’s Consciousness in relationship to The Creator and the creative ability provided by Him in one’s Prayer. To Actualize one’s Hopes and dreams and thereby Desires into a sense of accomplishment or reality, an expansion of Consciousness must indeed first take place. To experience the Medicine of Actualization Proper, one must first express and embrace Openness and a belief that indeed it is possible for oneself to be able to realize a fulfillment of one’s Prayer by The Creator for that which is sought. As one can readily see, Actualization Proper and the number of sixteen have inherent in them, a Consciousness to experience and Receivership, and the key ingredient to it is Prayer and one’s Openness of Consciousness. If one does not truly believe a thing is possible, it simply will not be. To Actualize a thing into existence, be it for oneself or any other being or thing, one must first believe that it is possible and that Great Pop and the All of Creation will support the fulfillment of that Prayer of Desire, whatever it is or might be. This is really how all things occur and although it is very simple, I have yet to master that ability of self as my Bark on tree seems to want to stifle my Receivership in most, if not all cases. This condition is resultant most often from taught behavior or some self manifested doubt or fear. Yet, when I am able to give these things away and allow for the Will of The Creator to become that of myself and not attach to the outcome, most often if not in all cases my Prayer of Desire is Actualized in some manner or way. It is important to mention here that my Fears as well as Hopes are being described here, as both are Prayers of Desire and thereby are Potential of events and experiences that may become Actualized at some or any moment. All of this is inherent in the Medicine of Actualization and the number sixteen and as one can see, the symbol also reflects the depths of it. One can quickly recognize that the symbol has changed dynamically from the number of fifteen. This Change is reflective of that of the Medicine of the number of sixteen and Actualization as well. One can quickly recognize that there exists a dynamic Potential inherent in the experience or expression of Actualization Proper. This dynamic condition of the Medicine of the number of sixteen is evidenced in the symbol by a realignment of the now four elements of the Law of One so as to become centered about their common foundations of their Yellow sides of Prayer and as mentioned, that is how Actualization occurs. Not only is this shifting evident, but also an expansion of the openness of the Black oval into a circle that now is situated at the perimeter of the elements of The Law of one. This reflects the condition that Openness is necessary for Actualization to occur, as well as the expansion of that All of Creation that will result in the experience of that Actualization. This Black circle reminds us that whatever we might choose to effect and Actualize for ourselves through an expression of a Prayer of Desire, will also effect any and the All of the Web of Creation as well. Also of significance in the symbol is how the axis if the inner Medicine Wheels of the Law of One now make a perfect square shape in the center of this symbol. This reflects the Medicine of Balance that is necessary and resultant from Actualization in The Medicine and Proper Way or in reality, in any way at all. This condition to Balance necessary for Actualization to occur, is also reflected in the arrangement of the sides of the elements of the Law of One whereby the Blue sides are adjoining and opposite of the others, as well as that of the Green ones. Yes indeed, sweet sixteen is a very special and powerful number indeed. 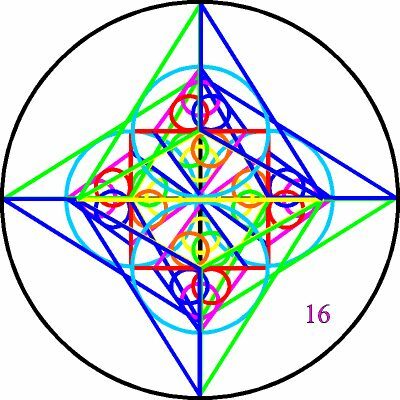 As the sum of the digits of sixteen total seven, one might also recognize the reflection of this Medicine of Ordination in the number sixteen, as the parts of the symbol have now again made an even greater Medicine Wheel. The Consciousness and Medicine of sixteen and Actualization Proper does easily reflect the addition or giving of Direction to Realization, or one plus fifteen as well as being the Union of Resource in the way of two times four. Actualization Proper also reflects a Consciousness of the Source in the manner of being the Resonance of Resonance and Medicine or four times four. These weekly messages and understandings are excerpts of Unedited Original channeled material (hence the phrasing and long sentence structures) from the offerings as described and available under the section of Books in this site.